Cranberry, gotu kola and liquorice extracts meet nanotechnology that coat each individual lash with a caring formula that is rich in colour. Thanks to the innovative, specially developed connection system, the three different styling brushes can be changed quickly and easily. To do this, place the selected brush in the opened bottle, then put on the cap again and close. 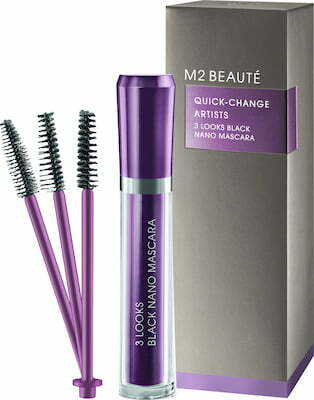 The next time you open the mascara, the brush and the cap will be connected and you can create your desired look. As soon as you want a new look for your lashes, simply remove the brush from the cap using a tissue and replace it with another.